Angel false eyelashes are made with white luminescent beads that go all along the lash line giving your eyes a halo-like effect. Perfect for the stage, photographs or just a special occasion, this style is designed to glow in UV light. Handmade with natural hairs and adorned with lightweight beads, these lashes will give you an out of body experience you won’t forget. Many of our customers aren’t familiar with the concept of curling eyelashes. They are even less familiar with how to curl false lashes and do not think it is possible. Curling them being a bad idea is often a common misconception; you can curl them just as you would with real eyelashes. 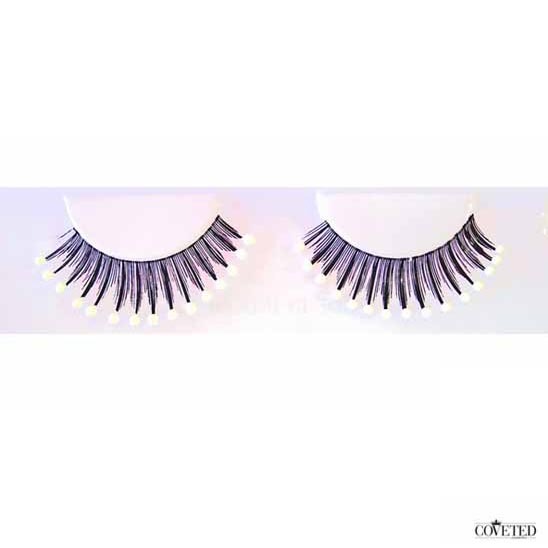 To curl them, you want to wait until you have applied the lashes on and the eyelash glue is completely dried. You can then apply some mascara on your real lashes as well as your false eyelashes to help the two mend together better. After you have applied the mascara, place your eyelashes between the two clamps of your eyelash curler. Then pres the eyelash curler together a few time lightly and release the eyelash curler slowly. There are several different ways of how to use false eyelashes. Most people just use it the standard way and apply a single pair on the top lash line but you can go way beyond just that to change your look. Some people glue two pairs of eyelashes together for an enhanced effect. Some people cut the outer ends of the lashes and just use the ends to create a winged effect. Lastly some people place them on the bottom lash line creating a doll-like 1970’s look.